Fabian talks with Frank Demmler, who Inc Magazine dubbed Pittsburgh’s ‘startup whisperer.’ We discuss how branding can set the direction for a B2B brand and how vintage inspired clothing brand Modcloth used crowdsourcing on many innovative levels to turn into a brand that was worth between $51 million to $75 million to Walmart. In this episode, we talk with Frank Demmler, who can take credit for 500 companies, some 10,000 jobs, and $1 billion of investment capital. 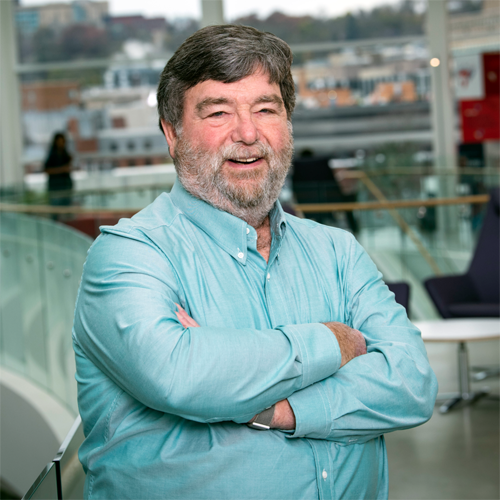 For over 30 years he has been an investor, advisor, and educator in Pittsburgh’s technology-based entrepreneurial community, which hardly existed when he first started but has grown to be one of the most active and desirable entrepreneurship hubs today. We dive into two of the companies he assisted, Automated Healthcare, which deploys robots in hospital pharmacies and has been acquired by McKesson for $65 million, and clothing brand Modcloth. He shares Modcloth’s startup story from college sweethearts to putting a few clothes online for sale to turning into a beloved brand that innovated especially through the power of crowdsourcing. Much to absorb in this episode, especially if you are interested in leveraging the power of your tribe. You can connect with Frank via LinkedIn. F Geyrhalter: Welcome to Hitting The Mark. We had so many founders on the show lately that it was definitely time to bring on an investor to once again hear from the other side of the table. Not just any investor. Today, we have the pleasure to pick the brain of a man who Income Magazine described as Pittsburgh’s startup whisperer. Taking credit for 500 companies, some 10,000 jobs, and $1 billion of investment capital. Today, we welcome the one and only Frank Demmler, who, for over 30 years has been an investor, advisor, and educator in Pittsburgh’s technology based entrepreneurial community, which hardly existed when he first started, but has grown to be one of the most active and desirable entrepreneurship hubs today. Frank has also been an adjunct professor for entrepreneurship at Carnegie Mellon University for over 30 years. With that being said, welcome Frank. F Demmler: Thank you Fabian. Looking forward to it. I want to make one correction. I don’t take credit for all of those things. The entrepreneurs who created the businesses and raised the money, they’re the ones who did it. I just helped. F Geyrhalter: I absolutely love that. You know, that kind of already sums up the type of person that I believe you are, so I’m so excited to finally have you on the show. Let’s talk a little bit about those companies that you invested in. It’s a pretty large number, and it’s hard to pick one or two brands to dive into today, but I was intrigued by two specifically. One of which, he actually picked. Let’s start with that one, because it’s a rather peculiar one. Automated Healthcare, which deploys robots in hospital pharmacies and has been acquired by McKesson for $65 million. Okay, so, if that did not get my listeners excited to have you on the show, I am not sure what would. Tell us a bit about Automated Healthcare, when and how you got involved, and how you saw it shape into a brand that is worth that amount of money. F Demmler: It was a situation where I had worked with the founders of the company in a variety of capacities; as an advisor, educator. One of the co-founders was a former of student of mine. Learned about, they had applied to an economic development organization in Pennsylvania called The Ben Franklin Technology Partnership, and they had been rejected for their grant. I was adamantly opposed to that decision, so I went and advocated on their behalf, and they were able to get, at that time, an $88,000 grant to purchase a robot so they could do the proof of concept of putting a robot in a hospital and having it be able to pick medications off a pegboard with reliability. With that introduction and interaction, when it came time for the company to raise money, I was a general partner of the Pittsburgh Seed Fund, and it was just a natural extension of what we’d been doing to make the investment in the company and help it move forward. F Geyrhalter: How do you feel that Automated Healthcare, like, what role did branding or the idea of branding play for Automated Healthcare? Because, obviously, they’re a B2B robotics brand in the healthcare space, so it feels, like, really far removed, but it seems like it still played a role. F Geyrhalter: I think it’s okay Frank, because I said over the last 30 years twice in my intro, so I kind of already gave away that there’s a huge amount of knowledge in you, let’s put it that way. F Demmler: Back in 1990, the healthcare system was undergoing major revolutions that continue to this day. One area of particular concern was that the error rate of medications leaving a hospital pharmacy and being delivered to a patient had an error rate between one and 10%, with an average of 1-3/4%. Most of those errors were things like 100mg of Tylenol instead of 15, or whatever, but some of them could be fatal. This appeared to be a great opportunity for the application of robotic technology, because in fact, the process of picking those pills was repetitive and could be programmed in such a way that a robot could do it, and that would replace an army of white-frocked young people running around the pharmacy doing hand picking, which was the way it was done back there. By saying Automated Healthcare, it positioned the company as one that was using advanced technology. It was resonating in an industry that was only beginning to appreciate that there were technologies that ultimately could be adopted by hospitals to improve patient care and improve financial performance. F Geyrhalter: It was really branding a new segment, like, disrupting with a new definition of what a business can do within the healthcare space. F Demmler: Exactly. It literally revolutionized how hospitals would manage and distribute their drugs. One of the benefits of that is, prior to Automated Healthcare, the professional pharmacist played more a role of a grocery store checkout person who would review the medications once they’d been picked and try to make sure that they were the right thing for the right patient. You had a highly compensated professional who really wasn’t able to do his or her professional job of working with the patients, working with the nurses, but was sitting there checking out sets of pills. F Geyrhalter: Well, and obviously, I think those are a lot of the jobs that are going to be replaced in the future and a lot of people are afraid of that, but the way that you put it and the way that I see it too, those are individuals that actually are not utilizing the full capacity of their intellect doing the work that they’re currently doing. It is actually a very positive movement, and it seems to me that Automated Healthcare and your investment in them or your mentoring them actually, they were pretty much on the forefront of what now is becoming a really widely discussed topic. F Demmler: Yeah, and I believe that Automated Healthcare was the first time a hospital had introduced barcodes into its information system. Because, it was basically, the barcodes enabled the ability of, the medications were put in individual packages with barcodes on them, and then the arm of the robot would scan that barcode, confirm that it is what it is, pull it off, and do that. It was a very elegant but self contained application because the patient’s bed or nightstand would have a barcode confirming that it’s the patient. The nurse would have a barcoded wristband, and then the medication. What you had was a closed loop of information of how the pills have been distributed, or the medications. F Geyrhalter: Fascinating. Let’s move over to another brand that you helped shape over the years: ModCloth, which is a vintage inspired clothing brand for young women, and they had quite a great founding story. Tell us how you got involved with them and at what stage of the company’s foundation did they step in. Were they students of yours? F Demmler: Yes, well, the male was a student. I have to correct what I sent you. Koger is the last name, so Susan and Eric Koger are the founders of ModCloth. They had been high school sweethearts. They came to Carnegie Mellon University as students, and got married somewhere along the line. The thing was that Susan loved vintage clothing, so that whenever she and Eric were going to different towns, her first stop would be into the consignment stores and other sources of used or historical garments. She would buy probably a lot of stuff from those places, and it got to the point where their apartment was overflowing with her vintage clothing, and obviously she can’t wear all that often, and so ultimately they came up with the idea of, let’s sell Susan’s purchases over the internet. This is back in 2004, I believe. At that time, the internet, stores were beginning to emerge on the internet. Eric, who was a joint computer science and business major designed the website and got them up and going. Lo and behold, the reaction to Susan’s inventory was very positive, very strong. Susan came up with the concept of finding young designers who designed with vintage inspired concepts applied. They borrowed, I believe, on the order of $50,000 from an uncle, like, in October of 2004, so they could buy some inventory and get the designs made. Again, lo and behold, the designs were being gobbled up as soon as they hit the website. They actually used that to their advantage during the very earliest stages in that, because cash was tight, she would order whatever clothing she could based upon financial ability, put it on the site, and typically within one to three hours the inventory would sell out. That, then, caused the fans of the site to log in multiple times a day in order to not miss a new item coming on. That was probably one of the first social marketing tactics that I had seen that had been successful. That success got them into low six digit sales, slightly more than $100,000, which wasn’t chump change at that time, either. F Demmler: But, by the same token, because of the customer adoption and because of the brand that they had created, and branded Susan Koger as a thought leader or probably today would be called an influencer, she and the designs of the product line all became a brand and a product and a lifestyle that distinguished it from other such clothing providers. That got the attention of a number of very high profile angel investors, Jeff Fleur from StubHub, Mike Maples, Josh Kopelman among others. They put in a super angel round, I guess it would be called, and that’s what allowed the company to transition from a two person selling out of their apartment into a company. That success then led to institutional investors and over time, the brand grew from zero to over $150 million of annual revenues, and ultimately, it was acquired by Jet.com, which itself had been acquired by Walmart, because Walmart wanted to create some branded strategies rather than being viewed as a commodity/low price cheap provider. That was sort of the cycle of the business. It still exists as an independent brand, you can find it on the internet, but that’s sort of the history. F Geyrhalter: What a fascinating story. I mean, there’s a woman in college and she buys too much vintage clothing, and at some point the boyfriend says, “Look, let’s start selling that. Instead of using eBay, let me just create a website where we can sell your stuff.” That went from an $18,000 in income to $15 million in income in only four years. I mean those stories are amazing, and today if you go to the ModCloth website, it has Halsey and Awkwafina as models and, you know, and obviously it was just acquired by Walmart at the same time that I guess Bonobos was acquired by Walmart, so obviously to boost the Walmart brand for a younger audience. It’s such a success story and I believe that one of the big pieces to that brand’s success, and you hinted at it within your story about the brand, is crowdsourcing, because ModCloth actually became the first retailer, I read, to supplement an existing business model with crowdsourcing efforts. You know, as you mentioned, Susan started that, I guess she called it the B to buyer program, where she got her designs, post them on the site soliciting customers to vote for which design to produce, which then of course created a huge buzz and made the customer feel like they had a voice, but in turn, they pretty much presold product almost instantaneously, and I guess the genius moving crowdsourcing actually must have come out of a complete necessity at the time for her, because she just had to do it this way in order to sustain. F Demmler: Yes. I mean, she did. Exactly as you said, they didn’t have the cashflow that they could afford to invest in inventory and hope somebody bought it. She was able to basically create what were ultimately auctions of, “Here are five designs that we identified. Which one would you buy,” among the users. They would vote. Lo and behold, whoever won, that one would be purchased and the buyers were already predetermined, and so they would sell out pretty quickly. F Geyrhalter: Right, exactly. Just to give our listeners some more insight into all the different ways that she actually, well, ModCloth as a brand, is actually using crowdsourcing, here are three of them that I want to share that I read about. The first one is style gallery, which is a user generated image gallery where customers send in photos of themselves modeling in ModCloth designs, and then of course, you know, other people see how the clothing actually looks on real people. Then, there’s fit for me, which is a feature on the ModCloth app which allows you to see suggestions for clothing that will fit their exact body shape based on other user’s reviews. Then, last but not least, and I think this is such a cool thought, they ran a contest in 2012 called Make The Cut. What they did is, ModCloth created products based on consumer ideas. Suddenly, the consumer became an artist, and the contest winners had their drawings, their sketches of clothing, adapted into real clothes for the spring line, with each Make The Cut garment product then featuring the artist’s name printed on the label. You suddenly had your name on the back of a piece of clothing from a brand that you already love. F Geyrhalter: Obviously, they used some nifty brand strategies and they were also very in tune with the current site guys, because they were taking a stance on the topic of body image when it was rarely discussed in the media. Do you know with this particular startup investment of yours or nurturing of yours, mentoring of yours, when did the team actually started to actively invest time or money into brand strategy voice or design? I think a lot of it came very organic, but at some point they must have said, “Let’s hire an agency. Let’s do this the real way.” Do you know that transition or how a lot of these amazing brand thoughts came about with ModCloth? F Demmler: As you noted, some of them were organic. For example, the one where people would take pictures of themselves in outfits and share that, they’d also created a discussion board where people would be able to explain that they’re using a dress from one source and a blouse from another and a scarf from another and a pair of shoes. Then people would talk about, “Hey, have you tried such and such?” It was really part and parcel of the company. Once we had the super angels on board who did have consumer marketing backgrounds, they were able to help us in terms of identifying the right agencies. That would have been two to three years into the company, but 12 to 18 months after getting the super angel investment that they were able to do a full professional shift into the crowdsourcing and customer engagement. F Geyrhalter: When do you advise your companies, typically, to invest in branding? Does it vary by startup focus? Does it vary by B2B, B2C, you know, tack, you know, apps, etc? F Demmler: Yeah. Well, as an investor, what I want to do is mitigate risk. F Demmler: Certainly, with any B2C company, creating a brand that customers will resonate with is an essential part of that process. If the company’s vision, theme, culture, and brand aren’t all aligned, you end up with dissonance and very poor customer pickup. It really is essential that you put all of those things together on a branded basis in order to capture the customers. F Geyrhalter: Absolutely. With B2C companies, it sounds like you push them towards turning into that brand rather sooner than later, and with B2B companies you must probably take a little bit of a stance back. F Demmler: Yeah. I mean, for example, Automated Healthcare made great use of its brand, but the other technique that the founders did was, among their first 10 customers were four of the past five presidents of the American Hospital Pharmacy Association. Not only did the brand get established, but it got established and linked to thought leaders within their industry. You have everything sort of working in sync, reinforcing each bit. F Geyrhalter: Right, right. That creates that holistic brand, absolutely. How much of your time do you spend mentoring? It seems like you pretty much dedicated yourself to helping entrepreneurs thrive. Often, people hear the word investor and they immediately conjure up a stereotype which is not always positive. Right? But, it can in fact be a very nurturing and extremely satisfying line of work. F Demmler: Yeah, absolutely. I’ve been doing this since 1984, and every day is a new challenge with the opportunity to learn new technologies, to meet people who have dreams and aspirations, and to be able to help those people go from being a wannabe entrepreneur to an entrepreneur. Yeah, I spend my time very much on the early stage. Well over half my time is more in the nurturing and working with the companies. Then, when they get to a certain scale, either the investment mechanism that I’ve got where I will help them determine what investors might be appropriate to help them at what time. F Geyrhalter: Do you only work with startups within the Pittsburgh system, and they’re usually all part of incubators and accelerators, or the university that you work with? F Demmler: I work primarily in Pittsburgh. It’s where my network is and where I’ve got history and all of that. But, I also have worked with companies throughout North America, I guess. I did a webinar for the Technology Transfer Tactics, which is a industry Bible for university tech transfer offices. I talked about a variety of things that were germane to them, for example. The key thing I worked on there was splitting the founder’s pie. It had to do with university spin outs, how do you take 100% and divide it appropriately among whoever the founder group is. That’s a tangential. Yeah, working with the company and helping it figure out the ways of success, I mean, one way that I look at it is, if you put entrepreneurship on a scale of zero to 10, where zero is somebody who ought to keep a job, stay in a job, and not even think about being an entrepreneur, and then at 10 you’ve got your Mark Zuckerberg or that ilk, most of the people that I work with are sort of in the zero to three range. They typically will have one or two key strengths that are relevant. University spin outs, obviously, it’s going to be the technology and the ownership in the technology. My goal is to help those people get into the range of six-plus. What I mean by that is, they will understand the vocabulary of what they’ve gotten into. They will understand why a bank is not going to fund them on the first day, and understand how investors will be looking at them. I’ve spent a lot of my time doing that, and for the ones that can move to that level, then getting them funded. Here at Pittsburgh, we’ve had the Innovation Works, which I was with for 13 years, founded Alpha Lab as one of the first incubators in the country, founded back in 2008. It has created, typically it’ll have 12 to 15 new companies a year divided into two cycles. We also have Alpha Lab Gear, which is a hardware-oriented accelerator. They are adding to the mix of companies. They don’t dominate it because quite often, well, accelerator companies are often pretty fragile, even when they go through the process. Working with them to make them investment ready sometimes takes more than what the accelerator program provides. F Geyrhalter: Oh, for sure, yeah. I mean, you’ve been doing this since 1984. What is a big piece of brand advice that you can share with our founders as a takeaway from this podcast session? F Demmler: Today the thought is, customer discovery is the bellwether of being an entrepreneur. Unlike when I first started this business, where it might cost a half a million dollars to develop a software product, you know, in today’s world, it’s $25,000 or $50,000. You actually do have the ability to go to customers and get their direct feedback on what it is you’re trying to do, and as you do that, you listen to what your customers tell you, and quite often, you’ll find out that the business you thought you were in isn’t that at all, but what you’re providing to the customers has a different value. Once you’ve sort of hit on that, the core value of the offering, then branding that and using that as a way to create identity and growth is essential. F Geyrhalter: In the end, it is about empathy with your customer. Right? Really, really, putting yourself into their shoes and listening to them and understanding what they actually ache for, despite what you offer, and then moving your product more into their sphere. F Geyrhalter: Thank you Frank. I think it took us quite a bit of back and forth to finally make this happen, but I’m so grateful that you were able to take this 20 minutes of your time from your many duties as the startup whisperer to educate my listeners. I really appreciate it. F Demmler: Happy to do it Fabian. Feel free to call me in the future if you’d like. F Geyrhalter: Absolutely, and thank you all for listening. Please take a few seconds right now to hit that subscribe button and give the show a quick rating. It is the only currency I take from you in return for putting together this show every two weeks, from finding interesting guests like Frank to getting them booked, prepping, recording, and doing the post. It is definitely a time consuming labor of love. This podcast is brought to you by FINIEN, a brand consultancy creating strategic verbal and visual brand clarity. You can learn more about FINIEN, which I also happen to run, and explore my books on brand building at FINIEN.com. The Hitting The Mark music was written and produced by Happiness Won. I will see you next time, when we once again will be Hitting The Mark.